If you want your home to be clean and love gaming then you want to check out this fun Super Mario doormat. The Nintendo doormat is made from coir and is 17 x 29 inches and officially licensed by Nintendo. 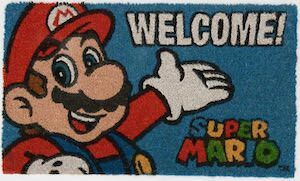 The doormat has a blue background and on that you can see Super Mario while he points to the word “Welcome” and then there is his Super Mario logo too. So now you can have the Nintendo doormat in front of you game room or just at the front or back door so that no dirty feet enter your home or room. Get one now so come get your Super Mario Doormat!